The EverFocus ED 200-220 Color Mini Dome is a 1/3" Color Mini Dome Camera. The EverFocus ED 200-220 Color Mini Dome attains its High Sensitivity of 0.3lux/F=1.2 from advanced 1/3" Sony color CCD. The electronic shutter and AGC allow the camera to be used in environments with varying light levels. It incorporates built-in anti aliasing and IR-cut optical filter. Compact in size (4.2 (outer diameter) x 3.1 (D) in) the system is available for NTSC and PAL. 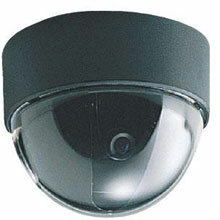 The ED 200-220 Color Mini Dome is equipped with Wide Range Automatic Electronic Shutter. With the ED 200-220 Color Mini Dome, it is able to adjust the viewing range with manual zoom lens. The EverFocus ED 200-220 Color Mini Dome utilizes Innovative Pure Vision Technology. The EverFocus ED200/N-6B is also known as EVF-ED200N6B	or ED200N6B	.